Ever have one of those moments where you’re so excited for a DIY project that you go and buy all of the supplies you need, but when it comes time to actually make the project you find your excitement and inspiration has all but vanished? Or how about the times when you know you have a project you need to get done, but you just can’t bring yourself to even start planning it out? There’s nothing more frustrating than desperately wanting the outcome of a DIY project but not having the motivation to do the actual work and make it happen. And this is really common! Ask any DIYer, and they’ll show you a to do list that’s a mile long. I have one, and I’ll bet you do too. Some of the projects are on the list for a very short time, while others are on the list for months and years at a time. Because let’s face it, though creating and DIYing can be great fun, it can also be stressful and overwhelming. Not every DIY project is walk in the park! Sometimes it takes lots of hard work, sweat and, if we’re being honest, tears. So we put it off. Many times we put it off for so long that it just becomes routine to push it back for another week, another month, another year. We reason with ourselves “What’s one more week, in the grand scheme of things?” And it’s not that we’re lazy or we just don’t care. Often times, we put off projects for very specific reasons. But one of the biggest reasons we put off DIY projects is fear of failure. And we let those self-defeating thoughts take over and convince us that we’re better off just putting that project off for another day so we don’t have to face the possibility of failure. And while it’s true, failure is always a slim possibility in any undertaking, it’s important to keep in mind that very very very few DIY projects end in utter and complete failure. Sometimes a project goes a different way than we had planned, and sometimes we need to start over and regroup or try a different method, but when we really try and make an effort, the chances of our project actually failing are slim to none. And while your project might not turn out exactly how you had envisioned, there’s the possibility that it might be even better than you imagined! And it’s definitely not worth it to miss out on an amazing DIY just because something might go wrong. And the power of belief is often all it takes to get the ball rolling. To help you get to work on your DIY projects, I’ve put together an amazing DIY project planner for you. It’s completely free, and you can print it out and fill it in with your DIY project plans and ideas to help you get started, stay motivated, and actually complete your projects! 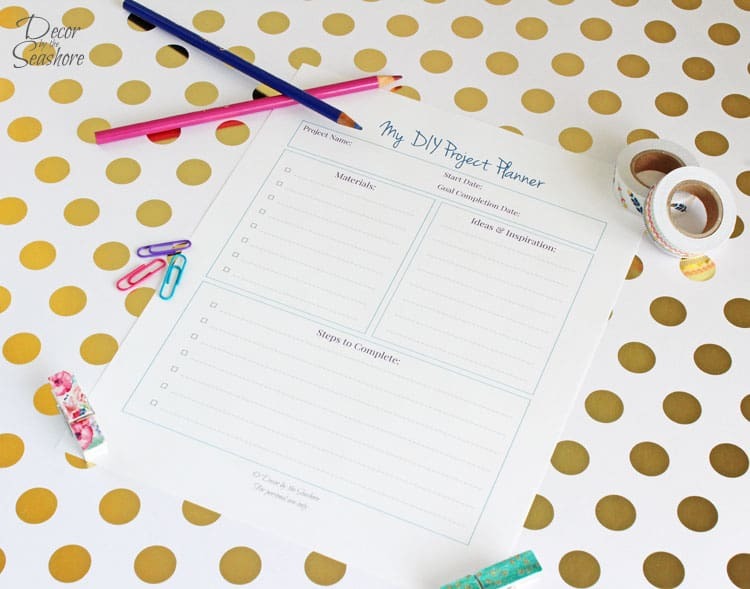 Download your free DIY project planner below! 1. Figure out what’s holding you back, and make a plan to address it. 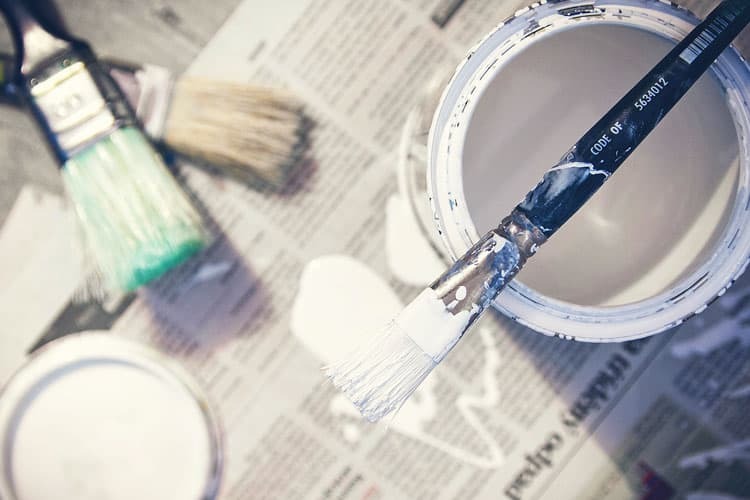 Why have you really been putting your DIY project off? Take a minute to figure it out and work through it. If it’s lack of time, create a schedule and make time for your project. If it’s trouble affording the supplies, figure out how you might be able to use coupons, find sales, and shop at thrift stores and clearance sections to get what you need to complete your project. If it’s not understanding how to complete your project, look for directions in a book or online. Whenever I’m looking for DIY motivation or instructions, I usually turn to Pinterest. 2. Plan ahead. Gather all of the supplies you’ll need and review any instructions so when it’s time to do the actual work, you’ll be ready. Nothing halts progress faster than beginning a project and then discovering you don’t have all of the tools or materials you need, or you don’t know how to complete the project. Get everything you need ahead of time so that once you start working, you won’t hit a dead end. 3. Break the project down into smaller tasks. This is especially important if it’s a larger project that will take a decent chunk of time to complete. Breaking it down into smaller pieces allows you to make progress a little at a time instead of being overwhelmed by the massive amount of time you’ll have to spend completing the project. This also gives you a chance to step back and take a break from the project. 4. Enlist helpers. Some projects are so big and complicated that they require more than two hands, and in that case, it’s important to enlist some helpers beforehand. Ask family, friends, and neighbors if they’d be willing to help you complete your project. You can offer to help them with a project in exchange, which can be a win-win for everyone! 6. Set a schedule, and stick to it! Sit down and figure out the exact times and dates you’ll be devoting to completing your project. Mark the dates on your calendar so you don’t forget, and include a goal completion date. If you have people helping you, make sure to think of their schedules and double check their availability. 7. Make it fun. When it comes time to actually do the work, making it a fun project instead of a boring chore will really affect the outcome of the project. Remember to maintain a positive attitude (this is especially important if you have helpers)! I’m a firm believer that nothing helps set the stage more than some upbeat music, so don’t forget to turn on your favorite tunes! 8. Reward yourself when the job is done. An ice cream cone or excursion to your favorite store is a great way to keep yourself accountable when the motivation is lacking. So when the job is done, celebrate! Be proud of your accomplishment, and don’t forget to show it off! Are there any DIY projects you’ve been putting off? What’s stopping you from completing them? Drop a note in the comments and let me know, and we can be accountability partners together! I have SO MANY DIY projects sitting around, half-finished. Thank you for the concrete steps to take to finish some of these! Time is definitely the biggest obstacle for me, but breaking projects into smaller parts will help me feel motivated to complete them! Catherine, I hope this helps you get some of those half-started projects finished! I find that if you’re pressed for time, the best thing is to break them up into smaller steps and work on them a little at a time! Great list! My biggest is time. I “blame” my three kids. 😉 If I can plan ahead though, I’m golden. Visiting from Friday Finds party. Thanks, Victoria! It can be hard to find time to get projects done, especially with kids. If you plan ahead and break your projects down into smaller steps, it can definitely help you complete some of those DIY projects! LOVE. 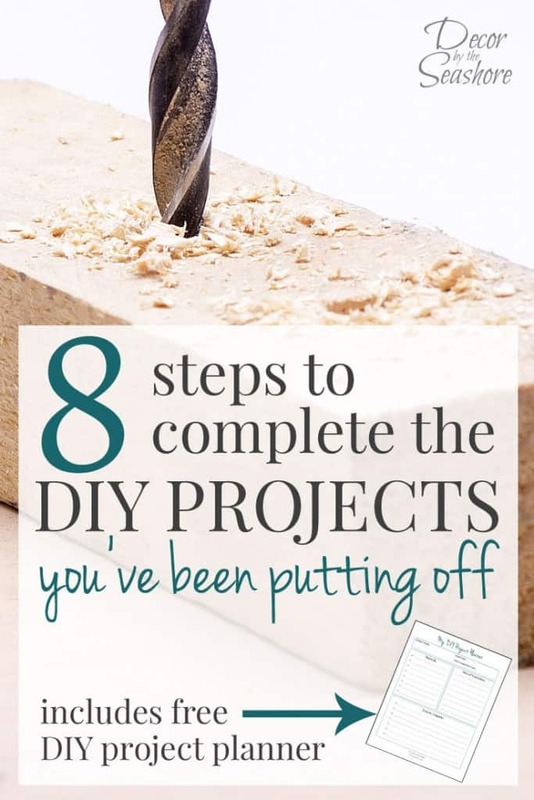 I have way too many half finished projects because I’m constantly all over the place – such great tips!! Thanks, Morgan! Story of my life as a DIYer! I tend to go through spurts of being super productive and finishing lots of projects and then other times just starting lots of projects and finishing none of them, haha! Hope this helps you get some of those projects finished. These are all great tips to getting your projects done in time and not be overwhelmed and stressed! I love being organized and this is a great help! Thank you so much for sharing at Sweet Inspiration #4! Have a lovely Saturday! Thanks so much, Katrin! This is a great way to stay organized and get some of those projects completed! Great article!! My biggest reason would be that I have too many ideas and want to start them right away. That leaves me often enough with a full table to projects. But I’m equally good in finishing them off at once (when the mood strikes haha). Thanks for sharing at our DIY Crush Craft Party!! Hope to see you this Thursdays at 7pm EST. Have a great rest of the week! Thanks, Denise! I also go through times where I start a lot of projects and (hopefully eventually) finish them all. Such is the life of a DIYer! I’ll be sure to stop by your link party this week. It’s like you’re reading my mind or you been walking around in my shoes the last 3 days. I was ask to make something special for my Aunt to put by my Uncle’s headstone. He passed in August & it will be 2 year this August to Honor Him for Memorial Day. She ask me the first Sunday in May of course I never thought about it again. I have worked on it 3 days throwing everything away over, over and over again. I was so nervous because it means so much that she ask me. There has been so much going on I didn’t remember it until Friday and I freaked out. Which had my nerves raw already then to have my husband starting about me waiting to the last minute AGAIN! So after a shower, ice cream and sitting in my bedroom with the 70’s music on the TV I pulled all my items I need in the bed. It didn’t take me 45 minutes to get everything done except glueing the base on, that was my morning job. So I’m happy to report my Aunt is very understanding and loved the Memorial picture / plaque. So does His 11 brothers & sisters ( my aunts & uncles) has really loved it. All that was said for me to say- I so wish I could have found you a week ago. If was like you picked my brained, and I absolutely love the print outs I have really got to write and schedule my crafts projects. Also i was just looking at my other print outs and a few weeks ago I found where you talked about decluttering your craft room , OMG! I it was you thst helped me with that mess. I drawed out my floor plan along with inventory list all I can say is Thank You, Thank You! Lorrie, it means so much to me that you found this post so helpful! I’m so glad to hear you were able to complete the project for your uncle’s headstone in time for Memorial Day. It can be so hard to start and complete those kinds of projects because, like you said, there is so much meaning and weight behind it. But often all it takes is a little momentum to get started, and once we do we find it actually doesn’t take long at all to get the job done, and the results are way better than we even imagined. I’m so glad you found this and several of my other posts helpful. It always makes me so happy to be able to help my fellow crafters! I started a quilt at a workshop which was supposed to be ok for beginners but it hasn’t really worked and has sat for two years under the bed. I no longer have the sofa for which it was designed as a throw! I am going to cut it up and use as a back and seat cushion for my new rocking chair but I keep putting it off in case this isn’t right either. I’m going to print out the day template and fill it in so I have steps to follow. Thank you. Don’t worry, Angela, I’m pretty sure we all have those kinds of half-finished projects that have been sitting around for years! I like your idea of putting a different spin on the project. If you’re not going to be able to complete it as is, repurpose it and find a different use for it! That’s much better than having it sitting around just taking up space and collecting dust!